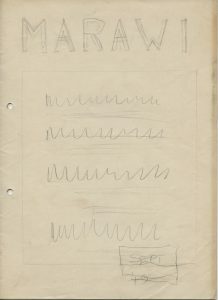 ‘Marawi’ magazine – as roughly doodled here – never came into existence. Instead, Kamuzu Banda – future President of what was then Nyasaland told Peter Mackay that he had different ideas for the Chichewa word which literally translates as ‘flames’. Mackay renamed his magazine Tsopano and Marawi was adopted by the political party which rose from the ashes of the banned Nyasaland African Congress Party – the Malawi Congress Party. 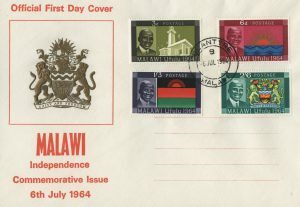 Later, as Nyasaland seized independence, the country also adopted this name and the imagery of the flame found its place in Malawi’s emblem: the rising sun. This early draft of what would become Tsopano magazine exemplifies the way in which Mackay united his passions to great effect. 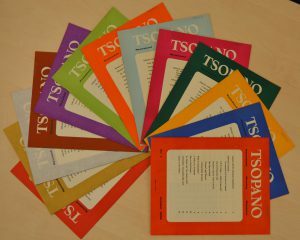 Tsopano aimed to allow Africans in Nyasaland to give voice to their angst and worries about the political situation in their country without fear of recrimination, encouraging freedom of speech during a time of censorship and seeking to educate and inform at a time when Mackay felt the decisions of the people were more important than ever. Mackay’s early choice of ‘Marawi‘ and its subsequent wider use only hints at how close Peter Mackay was to the heart of the independence movement in Malawi. The Peter Mackay archive is not only a rich account of political activism during a period of great change, it is also an account made striking by the singularity of its telling. Peter Mackay used his two greatest passions – journalism and photography – to aid and abet the movements towards independence, equality and philanthropism that came to define his life. This is an account of African history as could only be told by the Scottish journalist who fell in love with Africa.